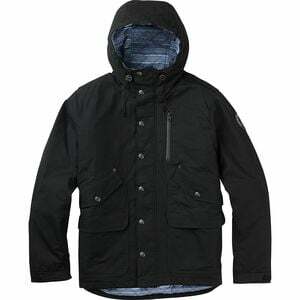 Product Condition: The Sherman Jacket - Men's is in Excellent condition. Jacket with new manufacture tags attached. Has some light dirt spots all over. Could be like new condition with one wash. The Burton Men's Sherman Jacket has that same vintage style that jackets from thrift stores have, except minus the holes and weird smell. Washed cotton canvas and DryRide Thermax insulation make the Sherman a perfect choice for shoulder season conditions. There's an internal media pocket and two triple-entry hand pockets, just in case six-armed aliens take over our world some day.